This flashlight stood out for its effective light distribution, 180 lumen brightness, boat friendly rubber housing, ease of use for long periods of time, and the five hours of life from standard batteries. If you’re looking for a waterproof light, this isn’t, but it can take a splash and is otherwise ideal, taking first place in a field of 15 flashlights. For this article I engaged my Wednesday night racing crew, familiar with my frequent flashlight purchases, as a panel of judges to choose among the six better flashlights of the 15 accumulated over the last two years. 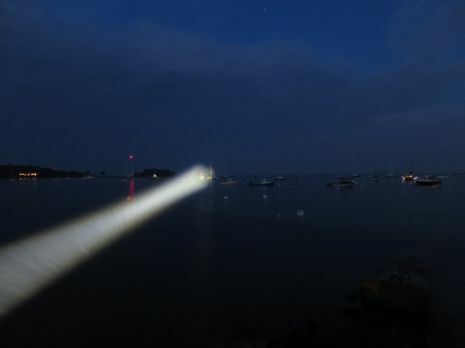 Each flashlight was evaluated over two Wednesday nights, both on the water and at the dock after our evening’s race activities. The second Wednesday included a bonus evaluation in moderate fog that rolled into the harbor while we were at the dock determining the winner. (Thank you Roy, Marcey, Janet, Brian, Katherine and George). Lights that were not among my six better lights included spotlights with proprietary rechargeable batteries. Virtually all rechargeable flashlights had warnings to unplug them after they are charged, which to me is ridiculous. Without a plug and forget charger, the batteries will be damaged if owned by me. Unfortunately, you don’t learn about this limitation on most lights until after you open the packaging. An example of a light with a plug and forget charger is the Q-Beam Blue Max 2 million candle power spot light that also is an all round quality build and has excellent focus, but was eliminated due to it’s hefty weight. Also not making it to the competition were wired spotlights that plug into my purpose- mounted bow and stern 12v sockets. Three versions of this type light fell into disuse for various reasons, not the least of which, they were heavy (including the cord) and tiring to use continuously on our 20 minute voyage from the bay to the dock. Also eliminated were numerous 1st and 2nd generation LED flashlights ranging up to 10 lumens that look bright close up or in the cabin, but are ineffective outdoors. 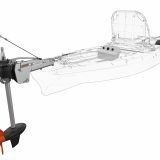 The 180 lumen Dorcy Cyber Light above provides a powerful beam of light that is effective for searching for objects on the water and effective on the deck for various sailboat tasks. It is shaped and textured to make it stay where you put it (won’t roll), and if dropped won’t break or damage the deck. The recessed push button on/off control is waterproof and easy to operate with a gloved hand. The light beam is fixed to be fairly narrow, with no focusing feature. It is very bright at 2 feet across at a distance of 10 feet, and throws off plenty of lower intensity light up to a width of 5 feet across, making it useful for repair jobs where you place it pointed at what you’re working on. At 200 feet, the main beam is bright and about 20 feet across in width, with little additional light noticeable on either side of the main beam. It left me wanting for a bit wider beam, but within that 20 foot wide area, it is very bright. The benefit of the narrow beam is an advertised range of 275 meters (900 feet) and our experience of 50 to 200 feet in fog mentioned below has me believing that the narrow beam is a good thing, putting 180 lumens to the best use in a marine environment. The narrow beam had me wondering if the 500 lumen Dorcy rechargeable with its wide beam and higher output would be favored by the judges. The LED bulb makes it possible for the product to have a light weight rechargeable battery, and overall would seem ideal to find things quickly in the vastness of the sea at night. It lights up an area almost 200 feet across at a distance of 500 feet, and shares many good features with the Cyber light, also covered in a bright yellow casing that makes it hard to loose, is shaped and textured to make it stay where you put it (won’t roll), and if dropped it won’t break or damage the deck or itself. 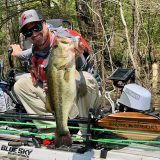 There were three undesirable affects of the larger 500 Lumen Dorcy however, that not only lost it the competition but eliminated it from being a runner up as well. First, when my crew used the light it would demolish my night vision, even when pointed straight ahead. Light reflected off my furled headsail and other surfaces was quite bright even from 30 feet back at the helm. I would then become dependent on where the light was pointed to see anything, I couldn’t even see my fingers on the wheel. Secondly, with such a wide beam, it was hard to avoid lighting up every boat in the channel which was potentially rude as well as a safety hazard for us if we were going to blind other boaters. Lastly, our second night of testing was in moderate fog, at which point my crew took an intense disliking to this light as the wide beam appeared unable to penetrate the fog, but very good at blinding the user due to the intensity and wide beam of light reflected back off the fog. The light was booed by the crew and eliminated from the competition last minute due to its flash back in the fog. Comparably, the narrower 180 lumen Cyber Light was effective at fully illuminating objects 50+ feet away in the same moderate fog without blinding the user, and did barely illuminate a mark almost 200 feet away (normal range is 900 feet). The Cyber Light earned many extra votes as there was somewhat of a wow factor as the crew searched for objects in the fog seeing how distant it can go, knocking the next closest competitor, a $65 200 Lumen Coast T7 Speed Focus flashlight, out of contention. Mind you, at more than 50 feet all we really got back were vague reflections. It didn’t really cut through the fog that much, just better than the other flashlights. In such situations perhaps you would really want a FLIR. Other things I like about the Cyber Light is that it is powered by standard AA batteries, runs for over 5 hours, and gives you more than an hour warning that you’re nearing the end of the battery life. At that point it blinks a lot (as if a wire is loose) but is very usable until you get around to loading another set of batteries. It uses four batteries, which is a convenient number if using rechargeable AA batteries on chargers that charge batteries only in pairs. I have found this light handy on my dinghy as well, for the same reasons as above, plus if I desire to get another boat’s attention, the narrow bright beam has been effective at getting the attention of approaching power boats. On the downside, the overall tough and waterproof appearance of this light isn’t enough to prevent water from getting into the battery compartment of the Cyber Light that lives in my 9 foot dinghy. 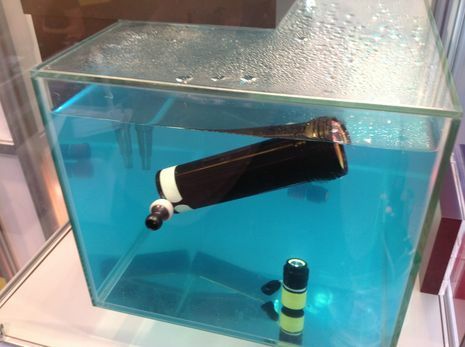 It experienced corrosion of the battery terminal within four months of use. But at $19 and so much going for it, I went ahead and replaced it with an identical light. 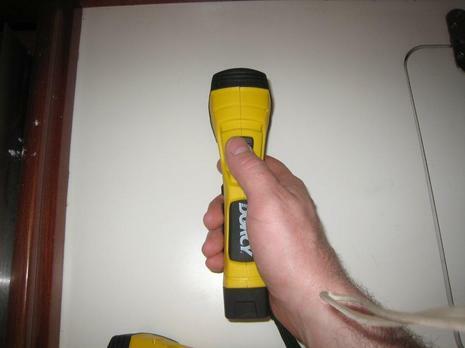 I own five of these Cyber Lights now (three on the sailboat), with every other flashlight voted off the boat except for this Dorcy work light, picture below, which is ok for lighting up the cockpit when we have guests. The Cyber Light actually makes a better work light, but when I need a wide beam for something like a cockpit light, I like that this light can be plugged in for extended periods of time without damaging the battery. – Dan Corcoran is an avid sailor and leads ServiceSPAN, a back office work center technology and process improvement company. Previous story Turning 65: social media & James Brown! During the recent hurricane and 7 days without power, this flash light did real well for my family, edging every other flashlight into retirement. No matter I was lighting up a room or walking the dog, these flashlights work real well at home. Sounds like a great light in every way except the waterproofness. Any chance of getting the manufacturer to make a gasket sealed dive light model? Aboard Gray Eagle we will only carry official dive lights that can be quickly used to go over the side if need be. Some dive lights are better then others as far as illumination and battery life go. I really like the testing method your crew used. 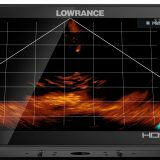 Appreciate your view on the Dorcy but I have found the Coast LED Lenser focusing LED Flashlight model HD7438CP to be great to have on the boat..so much so we have them mounted in wall hanging clips just about everywhere. 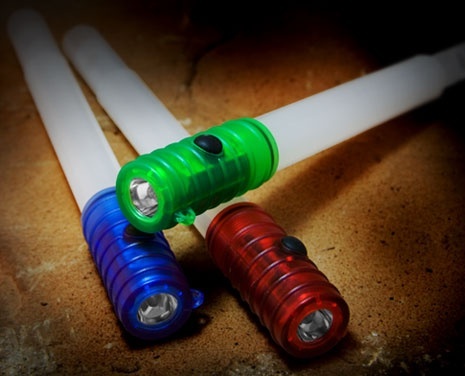 Rated at 105 lumin this little light has O ring for water resistance, comes with a nylon sheath and laynard and takes 3 AAA batteries that seem to last a long, long time. Now this is not perfect…I would prefer it to take AA batteries not AAA’s and to have a “flat” spot so it would not roll. This is not an inexpensive light at approx. $50.00 at Home Depot but small, easy to hold and use and very bright for its size. I’m using a Stanley FL5W10 waterproof spotlight (it floats). Nickel metal hydride rechargeable battery gives about 45 min at full brightness, and is dimable to 10 hr life.120v charger shuts off, 12v does not. Very focused beam + 500 lumen + waterproof makes it great for finding channel markers in rain without blinding helmsman. Try the Streamlight Survivor LED. This light is designed for firemen with a very narrow, intense beam that makes it a good option for spotting objects from the boat with minimal backscatter from moisture laden air. I use the 4AA battery version, which works very well with NiMh rechargeable cells, or alkaline cells if desired. They also have a spot light I havent tried yet on the company website. I don’t have AC power onboard. Can the worklight be recharged off of the 12V system? Thanks for the review. For what it’s worth, I have been very happy with the Cyclops in the link below on our sailboat. The charging light goes out when charged, so I assume it won’t overcharge the batts. Dustin asked about charging via 12V, the worklight pictured at the bottom of the article can only be charged via 110 VAC. I enjoyed checking out all the lights you all posted here as favorites. Do any of these lights penetrate many 100’s of feet into the fog ? Seeing 50 feet ahead isn’t much useful if I am moving faster than 2 knots. It uses four batteries, which is a convenient number if using rechargeable AA batteries on chargers that charge batteries only in pairs. I think that having a good AA charger is very important. A good charger is one which charges each cell independently and stops charging each when it is charged. Duracell makes a reasonably priced one (but I don’t think that all of Duracell’s chargers meet my criterion). I found it impossible to keep my AA cells in matched pairs even without lamps that took three cells. We found the Streamlight Survivor worked very well for us navigating the ICW at night where spotting the next mark is the main chore, so much so that we threw away the two large incandescent spotlights the previous owner left on the boat. The current model Survivors put out far, far more than the 65 lumens mentioned in the Amazon ad referred to above. Being able to use readily available rechargeable AA cells is also a big plus for any light. As for a charger, I recommend the Maha MH-C9000. This charges each cell individually, tells you how much it has put in, and will also cycle and analyze each cell if you choose. Has a max charge rate of 2000 mA/hr, so the Eneloops I like to use charge in about an hour. You can find this on Amazon too. Can anyone recommend something similar to the worklight in the article that can run off regular batteries or will charge off my 12v system? I need good lights for the cockpit for entertaining. The magnets on the back would be helpful as I could hang them from the Bimini support tubes. 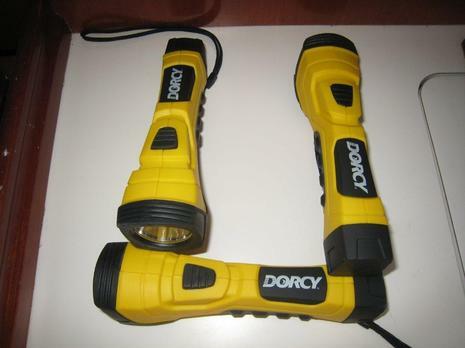 On your recommendation I bought the Dorcy Cyber Light and the Dorcy work light. The worklight is wonderful, offering up a room-filling bath of cool white LED glow. The cyber light is, in my humble opinion, merely adequate. I like the rubberized case of the Cyber Light and the fact that it won’t roll around, but I wish it was waterproof and I really dislike the beam shape. The cyber light projects a broad and fairly even circle of relatively dim light plus a very bright and very narrow center spot. I almost always find the center beam too bright and the outer beam too dim, whether used outdoors or indoors. My favorite LED flashlight, by way of contrast, projects an extremely uniform beam that is focusable from narrow to broad or anything in between. Unfortunately it is made entirely of metal, and I fear dropping it onto fiberglass or varnished wood – thus the continued search for the perfect flashlight. 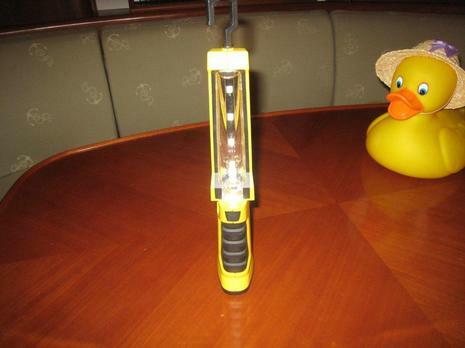 The dorcy worklight runs on 4AA batteries arranged in a pack. If you are just a bit handy with such things, you can modify it to use four loose AA NIMH batteries instead, though without the built-in charger. For the poster who asked about a good cockpit light i would suggest you look at Bebi – Electronics They have some of the best LED bulbs for yachting. There anchor light is by far and away the brightes in the anchorage with a draw of .08 amps. No flashlights but great LED lights for interior and exterior.